If asked to name the premier shmup series during the 16-bit era, most gamers would undoubtedly pick Thunder Force. The three titles that were released blasted their way across the console and into the hearts of gamers everywhere. This was how it was supposed to be done, and developers scrambled to mimic the style and presentation of Technosoft’s masterpiece franchise. Combining maniac action with incredible graphics and awesome soundtracks, Thunder Force took no prisoners. Yet after its fifth entry for both the Saturn and Playstation, the series upped and vanished. Technosoft quietly left the industry, and the series was no more. Why would anyone let one of gaming’s most cherished franchises disappear? What happened to the fabled sixth installment, which was slated to debut on the Sega Dreamcast? Many questions regarding Thunder Force‘s fate have yet to be resolved, and it remains to be seen if they ever will be. A fierce battle that spreads out across a gorgeous screen! The multi-directional scrolling and forceful sense of realism will draw you into battle space like none you have ever known before! Sounds interesting, eh? Sadly, it was never made available on more mainstream systems, and has never been rereleased. Finding all the hardware available to play it, should you actually find a copy, is difficult to say the least. Even emulation can be problematic. Fortunately, gamers fared better with the sequel, Thunder Force II, which appeared in 1988 on the X68000. It was also part of the Genesis’ domestic launch lineup a year later, and though that port was missing a few levels, it was still highly playable and challenging. The first sequel also introduced side scrolling stages to the series, and this quickly became the standard for the series from that point on. No other Thunder Force game would have top down stages. It’s place in the grand scheme of Genesis shmups is sometimes under appreciated, as this was the game that introduced us to the classic Thunder Force weaponry, such as the homing but weak hunter shot and the backfire gun. A voice over was also included for every time you received a power up, and gamers knew things were going to get tough when that alarm sounded the impending approach of a boss. It may not be the best in the series, but it’s a solid game nonetheless. The next release came in 1990, when Thunder Force III set the Genesis on fire. Gone were the top-down stages, and the game was now solely a side-scrolling affair. For such a small cart, it packed some of the biggest bosses and intense action ever seen at the time, and it was promptly bathed in accolades from several gaming publications of the time, including Electronic Gaming Monthly and GamePro. The backgrounds received special attention, using everything the Genesis could muster at the time, from warping effects for the fire world Gorgon, to the multiple parallax scrolling of the water planet Siren. It was simply a beautiful game for the time, and has actually aged quite well. The soundtrack was also vastly improved here, and set the foundation for the synth-rock the series would come to be known for. A version of Thunder Force III was made for arcades in 1990, called Thunder Force AC (ArCade). It was mostly a port of the Genesis game, but with a few different levels. It was released for the SNES as Thunder Spirits in 1992. Even with all its success, Technosoft was determined to take the series up a notch. The results of their efforts was Thunder Force IV, which is regarded as the best of the Genesis games, and perhaps even the best overall. Everything has been upgraded, and it is much longer than part three. Some of the stages are multiple screens in height! An interesting note about the game is that Sega, in a move typical for the company, changed the name for its U.S. release. The newly christened Lightening Force: Quest for the Darkstar not only showed how out of touch the company was, but that they also didn’t know how to spell (it should have read Lightning Force, without the e). What was this change supposed to represent? Was the game somehow lighter than past installments? Did it have brighter graphics or something? Perhaps one of the developers feel a sense of decreased weight and abdominal tension when her fetus descended into the pelvic cavity prior to labor, and the rest of the team decided to commemorate the event by naming the game after it. Regardless, the impact would have been the same had Sega spelled the name correctly, since all hope at marketing it as a part of the Genesis’ first family of shmups had been lost. Great work Sega! 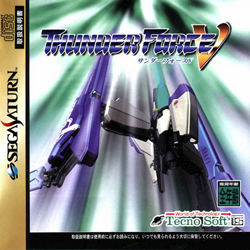 After Lightening Force, Thunder Force as a whole remained dormant until 1996, when the fifth entry was released on the Sega Saturn. Technosoft was wise to take advantage of the console’s strength, its 2D power, and designed the game to feature 3D graphics while retaining the classic gameplay. Thunder Force V was a natural evolution to the franchise, and was firing on all cylinders. Of course, Sega passed on a domestic release, and Working Designs instead took control. It was brought stateside for the Playstation in 1997 as Thunder Force V: Perfect System. Debate still rages as to whether it is superior to the Saturn original, but either way it’s a great game to play and own. The Japanese Saturn did get a special version, dubbed Special Pack, which included a music CD with remixed version of songs from the soundtracks for games 1-4. The Saturn in Japan also got two compilations, or Gold Packs. The first contained Thunder Force II & III, and the second included Thunder Force AC and IV. Too bad they never came out in the west. When Sega released the Dreamcast in 1999, Thunder Force fans were hoping to see another installment. The Saturn had seen a new game and two collections, so it wasn’t unreasonable to believe that things would continue on the new 128-bit system Sega was touting. Technosoft had released 14 games during the 32-bit era for both the Playstation and Saturn (the most for them in any generation), and they were having a good measure of success. Work began on Thunder Force VI, but for some reason never progressed beyond the planning stages. Some videos and artwork were floating around the internet, but any sites that had them posted have long since taken them offline, and there is practically nothing about the game to be found. So, the game was mysteriously cancelled, and Technosoft disappeared from gaming almost overnight. All references to the project have been pulled, which means that the game was most likely shelved at some point. No explanation was ever given, and Technosoft has since moved on to other things (though rumors abound about a return to the industry. They are recruiting again for a fiscal 2006 release. What that means is as much your guess as it is mine) Why was Thunder Force VI cancelled? The video below shows much promise, even though it’s only a CG intro movie (very clean and TF-like). Unfortunately, It would appear that no one knows anything about what happened, and though there may not be any material around relating to the game code itself, there are some tunes to listen to. While in development, an official soundtrack (OST) was completed by a company called Noise (founded by Technosoft alumni Tsukumo Hyakutaro). Noise is responsible for the music to Thunder Force V, as well as some other Technosoft titles, and they released this collection in 2001. Fans are trying to keep the dream alive, as happens with many projects that have been abandoned by their creators. One such project is Thunder Force Forever, which is attempting a fan-based version of Thunder Force VI. They seem to be fairly along, but it’s unclear whether or not a final game will ever be seen. With so many classic franchises coming out of retirement, and the shmup genre enjoying a new resurgence (who’d have thought we’d see a new R-Type and Gradius released in the same year? ), the time is ripe for Thunder Force make a comeback. Only time can tell, and for the moment, Technosoft is keeping deathly silent. Broken Thunder OST Info. Noise Web Site. 2003. Company Release Info. Technosoft. UVL. Game Info. Thunder Force 1 (It’s Finally Here!) thread. Shmups forum. February 5, 2005. Game Info & Images. Thunder Force VI Fan Project. Thunder Force Forever.